She is lovely! Wonderful chair side demeanor, doesn’t push or recommend procedures that are unnecessary. Dr. Sethi and her staff were all nice! My two sons had no problem with the visits and everything went well.I finally found a great dentist for my sons! Dr. Sethi and her staff were all nice! My two sons had no problem with the visits and everything went well. I finally found a great dentist for my sons! 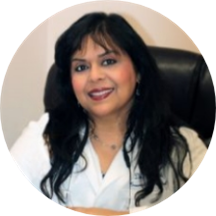 Dr. Sangeeta Sethi is a graduate of NYU College of Dentistry class of 1991. She furthered her dental expertise with a Pediatric Degree in 1993 and studied Orthodontics in 1995. Dr. Sethi has supplemented her traditional orthodontic education with Invisalign training , as well as, the necessary training to identify and treat Sleep and Breathing Disorders in the pediatric population. She has 25 years of experience working with small children and young adults. She is a wife and mother of three children and is compassionate to the needs of young people in their dental health. She is very good in what she does and she cares about your dental hygiene. Never had a dentist that good she explains everything and precisely. Dr. Sangeeta Sethi was amazing. I had so much anxieties walking in because of past experiences and lack of care on my part. The minute I met her she had me at ease and was super caring and professional. I woulddefinitely see her again and looking forward for my next appointment. Her staffs is nice as well. I went for just a cleaning. The wait was about 30 minutes. The cleaning was very through and I'm happy with the results. I plan on returning for my next visit. Only had a few mintues with the actual dentist, but she was very informative and open to any questions I had.